f) its size and organizational structure.. The application of a system of processes within an organization, together with the identification and interactions of these processes, and their management to produce desired outcome, can be referred to as the “process approach”. NOTE In addition, the methodology known as “Plan-Do-Check-Act＂(PDCA ) can be applied to all processes. PDCA can be briefly described as follows. ISO 9001 and ISO 9004 have been developed as a consistent pair of quality management system standards which have been designed to complement each other, but can also be used independently. At the time of publication of this International Standard ISO 9004 in under revision. The revised edition of ISO 9004 will provide guidance to management for achieving sustained success for any organization in a complex, demanding, and ever changing, environment. ISO 9004 provides a wider focus on quality management than ISO 9001; it addresses the needs and expectations of all interested parties and their satisfaction, by the systematic and continual improvement of the organization’s performance. However, it is not intended for certification, regulatory or contractual use. During the development of this International Standard, due consideration was given to the provisions of ISO 14001:2004 to enhance the compatibility of the two standards for the benefit of the user community. --- product intended for, or required by, a customer. The following referenced document are indispensable for the application of this document. For dated references, only the edition cited applies. For undated references, the latest edition of the referenced document (including any amendments) applies. ISO 9000:2005, Quality management systems ― Fundamentals and vocabulary. Where an organization chooses to outsource any process that affects product conformity with requirements, the organization shall ensure control over such processes. The type and extent of control to be applied to these outsourced processes shall be defined within the quality management system. 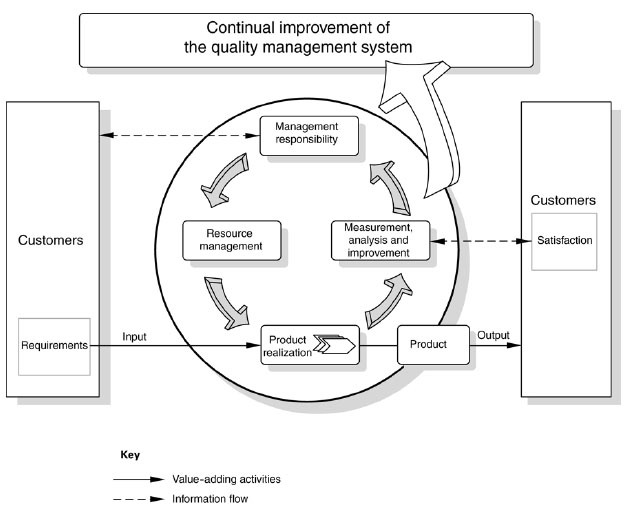 NOTE 1 Processes needed for the quality management system referred to above include processes for management activities, provision of resources, product realization and measurement, analysis and improvement. b) the degree to which the control for the process is shared. Records shall be remain legible, readily identifiable and retrievable. Top management shall ensure that quality objectives, including those needed to meet requirements for product [see 7.1 a]], are established at relevant functions and levels within the organization. The quality objectives shall be measurable and consistent with the quality policy. suitable for the organization's method of operations. NOTE Post-delivery activities may include, for example, actions under warranty provisions, contractual obligations such as maintenance services, and supplementary services such as recycling or final disposal. Note Design and development review, verification and validation have distinct purposes. They can be conducted and recorded separately or in any combination as suitable for the product and the organization. The outputs of design and development shall be provided in a form suitable for verification against the design and development input and shall be approved prior to release. NOTE Information for production and service provision can include details for the preservation of the product. where known. Wherever practicable, validation shall be completed prior to the delivery or implementation of the product. Records of the results of validation and any necessary actions shall be maintained (see 4.2.4). Design and development changes shall be identified and records maintained. The changes shall be reviewed, verified and validated, as appropriate, and approved before implementation. The review of design and development changes shall include evaluation of the effect of the changes on constituent parts and product already delivered. The organization shall evaluate and select suppliers based on their ability to supply product in accordance with the organization's requirements. Criteria for selection, evaluation and re-evaluation shall be established. Records of the results of evaluations and any necessary actions arising from the evaluation shall be maintained (see 4.2.4). The organization shall identify the product status with respect to monitoring and measurement requirements throughout product realization. Where traceability is a requirement, the organization shall control and record the unique identification of the product and maintain records (see 4.2.4). The organization shall preserve the product during internal processing and delivery to the intended destination. in order to maintain conformity to requirements. As applicable, This preservation shall include identification, handling, packaging, storage and protection. Preservation shall also apply to the constituent parts of a product. NOTE Monitoring customer perception can include obtaining input from sources such as customer satisfaction surveys, customer data on delivered product quality, user opinion surveys, lost business analysis, compliments, warranty claims, dealer reports. The organization shall apply suitable methods for monitoring and, where applicable, measurement of the quality management system processes. These methods shall demonstrate the ability of the processes to achieve planned results. When planned results are not achieved, correction and corrective action shall be taken, as appropriate, to ensure conformity of the product. The organization shall monitor and measure the characteristics of the product to verify that product requirements have been met. This shall be carried out at appropriate stages of the product realization process in accordance with the planned arrangements (see 7.1) Evidence of conformity with the acceptance criteria shall be maintained.